Home | News | What Does Your Dream Kitchen Look Like? A dream kitchen begins with inspiration. What inspires you? While you dream of flooring, cabinets, colors and textures, we’ll help you choose complementary or divergent patterns; décor that shines or recedes, two-toned or rich colors, flooring that resembles natural stone or the outdoors. We’ll suggest mosaics, backsplashes and sleek cabinetry with whisper-like closings. If you dream big, we’ll take care of the details. A beautiful kitchen must have a gorgeous tiles and Porcelanosa’s Airslate tiles offers a variety of textures and colors. Airslate tiles are large format natural stone slabs that feature a plexiglass membrane that allows it to curve and mold onto a surface which makes it ideal for installing on uneven surfaces. Airslate Delhi makes a stunning backdrop for an updated kitchen as does Airslate Patna with its rich caramel tones or Airslate Bombay boasting bits of rust, green and gold. Airslate is ideal for residential, commercial, exterior and even bathroom applications. 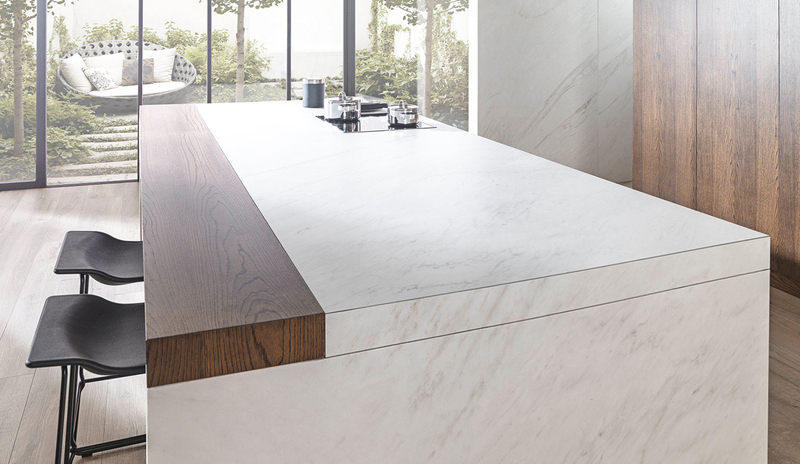 Every kitchen can benefit from having a gorgeous countertop in Krion® or XTONE materials. Krion is a solid-surface, anti-bacterial material. It’s also seamless, which makes it an ideal choice for kitchens, countertops, bathrooms and work surfaces as it’s easy to clean. A Krion Bianco Classic countertop is an ideal choice with its unique pattern of black, white and grey hues blended into a smooth surface. Krion is made from natural materials and resins which yield its sleek look. Color possibilities are endless as Krion is available in over 100 colors and patterns and can be customized to fit into your kitchen design. XTONE is made of porcelain and offers more of a natural stone look—so, if you like granite or marble, you’ll love XTONE. It also has matching wall and floor tiles, making it a snap to deck your entire kitchen out in marble or add mix-and-match accents. Considering the size of XTONE it’s still a fairly lightweight material to work with. Though Porcelanosa began as a tiny ceramic and porcelain factory more than 35 years ago, we’ve evolved into a design giant that can outfit a kitchen, bath, living area or an entire home with our unique collection of wall and floor tiles and our extensive collections of kitchen and bath products.